I’m tempted to just say “good luck”, because frankly I think you’ll need it! Not of course in the literal sense, since this is an entirely logical problem, which requires absolutely no guess work, but in terms of finding the right areas to make progress quickly. So having started at the end, let me introduce you to this Samurai Star Inequality puzzle. In all cases the “<” and “>” arrows point to the smaller number of each pair. Other than that it’s a regular Samurai Star – place 1 to 9 into each row, column and marked 3×3 box of each of the 5 underlying 9×9 grids (including the one in the centre). And now back to the beginning: Good luck! 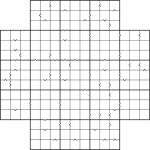 This entry was posted by Gareth Moore on December 8, 2009, and is filed under Inequality Sudoku, Samurai Star, Samurai Variants, Sudoku Variants. Follow any responses to this post through RSS 2.0. You can leave a response or trackback from your own site. I looked at it for a while and decided that I have too many other tasks and puzzles to do. And since my life has become very busy, it doesn’t look like I will be getting to it any time soon. I hope one day I’ll have the courage to come back to it. Yes Gareth, you proved you could make one without any numbers … now make em a little less intimidating please?